This topic contains 0 replies, has 1 voice, and was last updated by Mike Haldas 1 year, 2 months ago. This is how you can connect Defender HD security camera to an HDMI input of a TV or capture card. The latest defender HD security cameras use AHD video format (analog high definition). If you want to connect a Defender camera to a TV or video capture card via HDMI, you can use this AHD to HDMI converter. 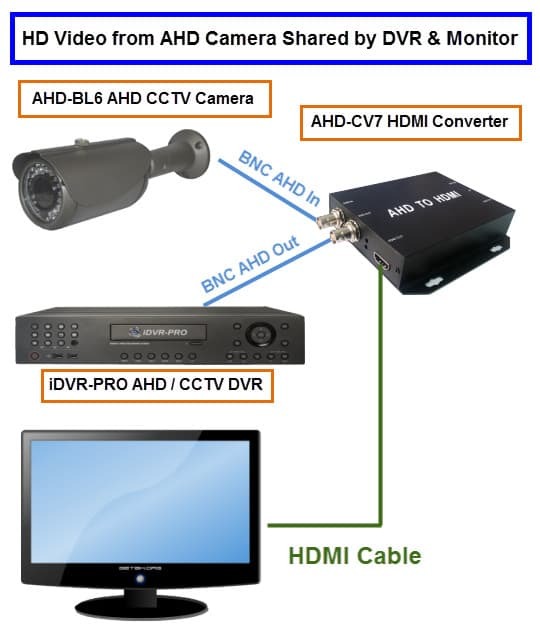 You can also use the BNC output of the AHD-CV7 converter to send the video signal to a Defender DVR or any other AHD compatible DVR. The above diagram shows how this is done using an iDVR-PRO DVR from CCTV Camera Pros. The same installation can be applied to Defender DVRs and HD security cameras. I recently had a customer that wanted to connect his Defender camera to an HDMI capture card that installed in a PC. This AHD-CV7 works for this application as well. This topic was modified 1 year, 2 months ago by Mike Haldas.